In 1878, the American geologist and explorer John Wesley Powell drew an invisible line in the dirt—a very long line. It was the 100th meridian west, the longitude he identified as the boundary between the humid eastern United States and the arid Western plains. Running south to north, the meridian cuts northward through the eastern states of Mexico, and on to Texas, Oklahoma, Kansas, Nebraska, the Dakotas, and the Canadian province of Manitoba on its way to the pole. Powell, best known for exploring the Grand Canyon and other parts of the West, was wary of large-scale settlement in that often harsh region, and tried convincing Congress to lay out water and land-management districts crossing state lines to deal with environmental constraints. Western political leaders hated the idea—they feared this might limit development, and their own power—and it never went anywhere. It was not the first time that politicians would ignore the advice of scientists. Now, 140 years later, scientists are looking again at the 100th meridian. In two just-published papers, they examine how it has played out in history so far, and what the future may hold. They confirm that the divide has turned out to be very real, as reflected by population and agriculture on opposite sides. They say also that the line appears to be slowly moving eastward, due to climate change. They say it will almost certainly continue shifting in coming decades, expanding the arid climate of the western plains into what we think of as the Midwest. The implications for farming and other pursuits could be huge. 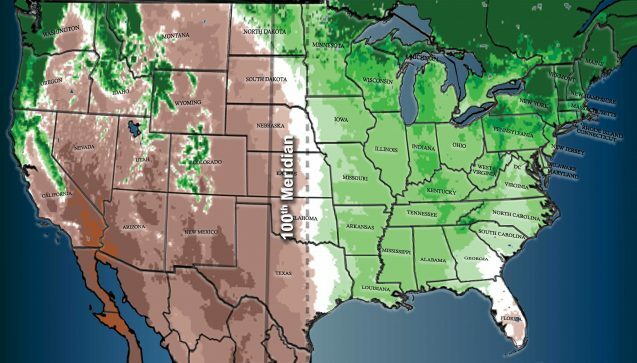 The 100th meridian west (solid line) has long been considered the divide between the relatively moist eastern United States, and the more arid West. Climate change may already have started shifting the divide eastward (dotted line). One can literally step over the meridian line on foot, but the boundary it represents is more gradual. In 1890, Powell wrote, “Passing from east to west across this belt a wonderful transformation is observed. On the east a luxuriant growth of grass is seen, and the gaudy flowers of the order Compositae make the prairie landscape beautiful. Passing westward, species after species of luxuriant grass and brilliant flowering plants disappear; the ground gradually becomes naked, with bunch grasses here and there; now and then a thorny cactus is seen, and the yucca plant thrusts out its sharp bayonets.” Today, his description would only partly apply; the “luxuriant grass” of the eastern prairie was long ago plowed under for corn, wheat and other crops, leaving only scraps of the original landscape. The scrubby growth of the thinly populated far western plains remains more intact. “Powell talked eloquently about the 100th meridian, and this concept of a boundary line has stayed with us down to the current day,” said Richard Seager, a climate scientist at Columbia University’s Lamont-Doherty Earth Observatory and lead author of the two papers. “We wanted to ask whether there really is such a divide, and whether it’s influenced human settlement.” He calls the studies an example of “psychogeography”—the examination of how environment affects human decisions. The papers appear in the current edition of the journal Earth Interactions. While the climate divide is not a literal line, it is about the closest thing around, easily seen on maps. Due to global-scale wind patterns, to the west of this longitude, rainfall drops off sharply. East of the line, it picks up sharply. Powell noted correctly that the western plains are dry in part because they lie in the rain shadow of the Rocky Mountains, which rake off almost all the moisture blowing in from the Pacific Ocean. Seager’s team identifies two other factors. In winter, Atlantic storms bring plenty of moisture into the eastern plains and Southeast, but don’t make it far enough to moisten the western plains. In summer, moisture from the Gulf of Mexico moves northward, but that also curves eastward, again providing the East with plenty of precipitation, while the West gets cheated. Seager says there is only one other such major straight-line climate divide on the global map: the one separating the Sahara Desert from the rest of Africa, also due to cutoffs of prevailing oceanic winds. In the United States, the effects show up in obvious ways. To the west, population density drops sharply. There are fewer homes, commercial facilities and roads. Farms are fewer, but bigger, reflecting the economics of less water and thus lower productivity. To the east, 70 percent of the crop is moisture-loving corn; to the west, aridity-resistant wheat is dominant. Now, the researchers say, warming climate appears to be pushing the divide east. In the northern plains, rainfall has not changed much, but temperatures are going up, increasing evaporation from the soil. Further south, concurrent shifts in wind patterns are in fact causing less rain to fall. Either way, this tends to push western aridity eastward. Data collected since about 1980 suggests that the statistical divide between humid and arid has now shifted closer to the 98th meridian, some 140 miles east. (In Texas, this would move it roughly from Abilene to Fort Worth.) Seager says year-to-year weather variations may blur the data, and in any case the changes are still too small and gradual to yet affect land use over wide areas. But he is confident that aridity will perceptibly move eastward during the 21st century, and eventually effect large-scale changes. Seager predicts that as drying progresses, farms further and further east will have to consolidate and become larger in order to remain viable. Unless farmers turn to irrigation or otherwise adapt, they will have to turn from corn to wheat or some other more suitable crop. 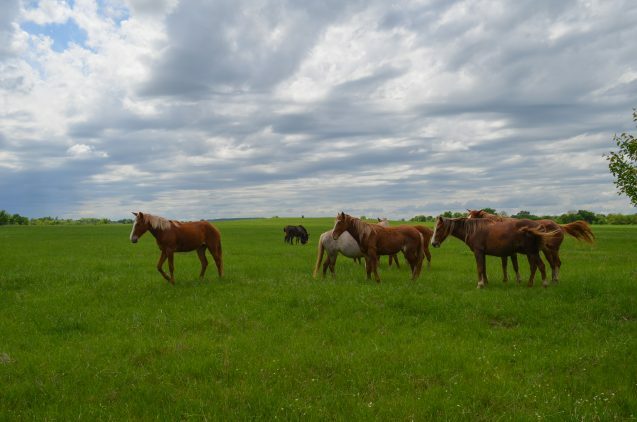 Large expanses of cropland may fail altogether, and have to be converted to western-style grazing range. Water supplies could become a problem for urban areas. Some historians say it could be argued that white settlement beyond the meridian influenced everything from the end of slavery (plantations could not expand beyond the line, weakening the South) to the development of modern firearms (settlers with single-shot muskets couldn’t compete with native peoples’ rapid-fire arrow attacks, until they became the first, best customers for new Colt repeating revolvers and rifles). The meridian itself is still registered in the popular imagination by historical roadside signs, books such Wallace Stegner’s “Beyond the Hundredth Meridian”, and the Canadian rock hit “At the Hundredth Meridian.” “It’s a reminder that climate really matters, then as it does today,” said Seager. The other authors of the study are Nathan Lis of Pennsylvania State University; Jamie Feldman of Columbia Engineering; and Mingfang Tang, Park Williams, Jennifer Nakamura, Haibo Liu and Naomi Henderson, all of Lamont-Doherty.